TalkMaster II – Tivo For Radio | OhGizmo! Sun-Denshi’s TalkMaster II brings all the benefits of time-shifting and easy Tivo-like recording to your favorite radio stations. Coming in 128Mb, 512Mb and now a 1Gb model, the TalkMaster II has 20 different user-programmable timers allowing you to record your favorite radio show any day of the week. Storage can be further increased with the units SD card slot which supports cards up to 1Gb in size. Besides being able to record directly from it’s AM (mono) and FM (stereo) tuners, the TMII also has the necessary hookups to record from an external source directly to MP3, WMA or a proprietary RVF format. Depending on the size of the internal memory the TalkMaster II runs between $240 and $330. The first version of the RYW came out in 2003, and had most of these features. The LX model, same as the Japanese one, offers higher sampling rates and better software. It is really like VCR for radio. To use it, you specify start and stop times, and frequency. It is in incredibly useful product which I use all the time. See amazon reviews for “Radio YourWay LX” for more real info. (With tivo you get daily downloads of program schedule and content info, and then you select programs by name or by content, e.g. record every show about llamas. No way does this even come close to that functionality. 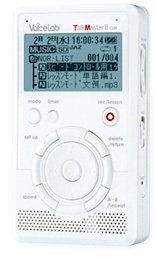 Get the Radio YourWay LX unless you want the screen in Japanese.